We know what it’s like… grocery shopping. It can be hectic and arduous at times, especially when you bring the kids along. 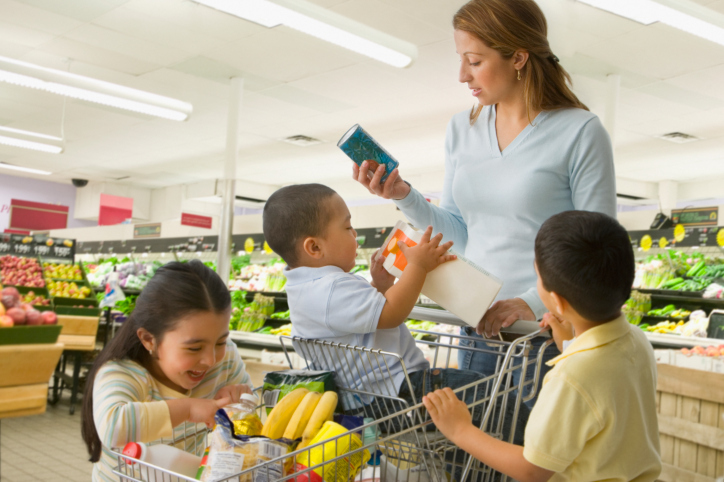 However, grocery shopping can actually be fun when you consider it a valuable opportunity to teach your kids about food and nutrition. By completing your chores and educating your children about food you’re killing two birds with one stone! Talking about food when your children are at a young age can be beneficial as they grow and make their own choices. Good habits start young, and how your kids are introduced to foods can affect the attitudes and/or openness they develop to certain food groups. Ultimately it will affect their future health and eating habits. Make a list – Lists help people stick to what’s needed, and avoid unhealthy choices. Kids will follow by example. By seeing that you make healthy choices, they’ll be more inclined to do so as well. They’re also great for teaching kids to plan ahead, and be wary of what’s expected when shopping. Talk – Speaking with children about the food you’re purchasing expands their knowledge on nutritional information and the benefits of eating certain foods over others. Experience – When people go shopping they often use all their senses to pick, feel, smell, and even taste products before purchasing. Encourage your children to get involved when you’re picking out food. Teaching them what to look for in produce will make them a smarter eater! Not to mention, they’ll be happy to be involved. Developing well-balanced eating habits at a young age is essential to healthy living. At Smart Lunches we would like to remind parents and their children about the importance of grocery shopping and the life lessons that go with it. Proper discussion of food enhances your child’s vocabulary, and educating your children at a young age will help them develop smart habits for life.